This is going to be a quick post on how to add a main menu, which will be the first scene that the user will see just like any other game. We will also add a countdown so as the user gets sufficient amount of time to get a feel of the game environment. The first thing that you want to do is to create a new C# script named CountdownScript in the scripts folder. Attach this script to the GameController gameobject. Now, it looks like a daunting task, the addition of the Countdown Timer. In a way it is, yeah, because we need to disable all the scripts, that we have created so far, as long as the count is not down. But yeah, we are no losers! Let's just do it. And once you do this, you will know how easy it was. High-Five! We need to define the references of all the gameobjects so as to get their components to disable/enable based on our requirements. The countMax lets you define the number from which you want to start the countdown. countDown holds the current countdown number. guiTextCountdown holds the GUIText component which we will be adding to the game scene later. There is quite a bit of code here, actually. Some terms might seem new to you, but yes this is no Rocket Science though. Since we have attached this script to the GameController gameobject, we dont need to add a reference to it, unlike the other gameobjects. That is precisely why we are using the term gameObject when getting it's components, while we are using the references to get the components of other gameobjects. MonoBehaviour type components are nothing but the scripts that we have written earlier. Since there are more than one scripts attached to the GameController gameobject, we are using the general term MonoBehaviour, to get the scripts, unlike in the other gameobjects, where we are specifying the script names to get and disable them. Further down the lines you see that we are calling a function named CountdownFunction alright, but why is it enclosed in StartCoroutine, peculiar eh! Well, we will come to it later. The CountdownFunction is where the logic of this script lies. "Wait, wait! Now, you didn't explain what StartCoroutine was and now you are using this IEnumerator as the return type of this function. What's going on?" These might be your question, I'm guessing. Well, let me clear that for you now. StartCoroutine basically starts a coroutine, Coroutines are functions where in you can pause the execution at any point in time using the Yield statement. The IEnumerator allows the program to yield things like the WaitForSeconds function, which lets you tell the script to wait without hogging the CPU. So, in brief, if you want to add a delay in your script execution, call the delay function from enclosed in a StartCoroutine, and that delay function should have a return type of IEnumerator i.e. wherever you have yield, it's return type should be IEnumerator. Once, the count is down we enable all the scripts disabled. We also disable the GUIText. Add a font to the GUIText. Change the size to, say, 40. Choose the color you wish to. Also, give the count max a value of 3. This is pretty much it. If you play the game, you will notice that the countdown works just about perfect. I started with saying a Quick Post, and ended up with perhaps the lengthiest post of this series. It's not over though. We still have to add the main menu. Save the current scene by using ctrl+s on Windows and cmd+s on the Mac. Go to File->New Scene or simply press ctrl+n/cmd+n, to create a new scene. Save the scene and name it as MainMenuScene. 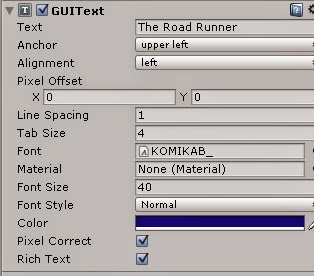 Fill the Text field with the name of our game i.e The Road Runner, set the font size to 40, add a font material as well. If you want to further enrich the scene, you can add the character as well and give it a default idle animation, and of course remove all the scripts. Create a new C# script named MainMenuScript, attach it to the Main Camera. The script will look very much like the other menu scripts. Save the script. Add the GUI skin. Name the scene to open on clicking the Play button. You can also create other scenes like Credits, Options, Instructions and others. and add that to the menu as well. Now test the game and feel free to customize it as per your needs. "Level 'main' (-1) couldn't be loaded because it has not been added to the build settings. i try to change my other scene with the name "gameLevel" but didnt work. Please be precise of what your problem is, so that we can be of any help..What exactly is the issue you are facing? When you press exit it doesn't quit the game. Why do the power up and obstacles move during the count down? Is the script missing something to disable them until after the count down? i try to add Text from the new UI menu but it refuse to be added as a GUI Text Countdown, can you help me with this? Hey mate, thanls for the awesome tutorial its taught me a lot! :) but I do have a problem, regarding the main menu, It works fine but I can't hit play, options, or anything. I think it could be a reference problem, but i dont know here to start. The ground is still moving even on countdown , can you please help? 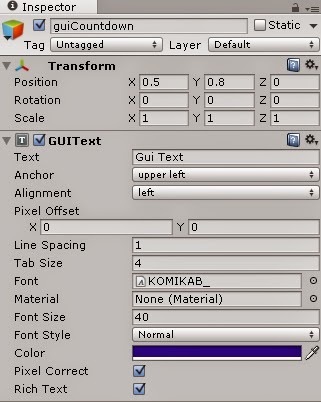 unity3d has problem with that codes because of using monobehaviours like that. I did just as u ,but when i press play it saying that the "Level '1' (-1) couldn't be loaded because it has not been added to the build settings." I added the scene in the build setting but it's not starting the game.